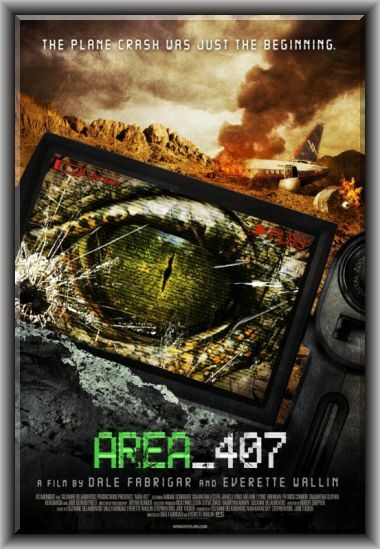 Area 407 is the latest fear filled film from IFC. This low budget, found footage story begins with two sisters boarding a plane from New York to Los Angels. As they do, we are introduced to several of the other passengers who inevitably become mainstays throughout the film. The plane finds it’s way into some rough turbulence and with some smooth editing, the flight comes to an abrupt end. The passengers must then work together to try and survive the crash as well as a unknown and very angry monster. This film is a roller coaster of emotions for the audience. The movie starts out a little slow, but quickly picks up the tension as the plane goes down. The suspense builds as the characters run for their life into an abandoned cabin while being chased by something in the shadows. The action starts to get a little repetitive as they keep moving from safe house to safe house. Why they keep going outside when they know something is out there to kill them is beyond me. The questions start to rise again as they find a truck but decide to drive back to the crash site instead of just driving away to safety. The one black eye of the cast was the young girl, Trish, who comes across as very obnoxious in the beginning and doesn’t really let up as the film progresses. The rest of the casting was top notch as the actors were believable and had definitely been in films before. I’m sure a lot of the film was improv and the cast did very well in keeping the scene progressing as a number of the takes were many minutes in length. The blood and wounds were very realistic and I must applaud work done on the wreckage of the plane. As for the “monster”…I would have rather never even seen a single frame of this mess. I am still boggled by what the filmmakers used as the unknown stalker in this film. This pretty much killed the film for me. The other negative was the twist ending that still has me scratching my head. This scene should have NEVER made the final cut of the film. The reveal of the monster, along with the addition of an unneeded character, left me completely baffled and unsatisfied. Overall, the film is very well paced and edited and the length of shots lasted is very impressive. This found footage film is very well produced and has many bright spots. Although the intrigue takes a nose dive after a while, the begging tension is well worth the watch. If you come across this film and have 90 minutes to spare, keep an open mind check out Area 407.